The Masters Curves gloves features all new premium amara and neoprene materials throughout the glove. No other glove fits like this glove. Details: • Aggressive pre-curve cut. • Longer overall length of glove to transfer load to wrist and forearm. Features improved wrist strap fit. • Ergonomic palm stitching. • Tighter, push on fingers for superior fit and grip. • Adjustable tab with interlocking tab. • Clip together snaps for drying and easier storage. 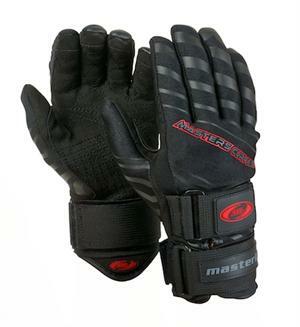 * These gloves feature much tighter fingers and require more care when putting on these gloves. This snug fit provides for superior grip and comfort in the palm. Sizes: XXXS-XXL. * NOTE: Colors/designs may vary slightly.